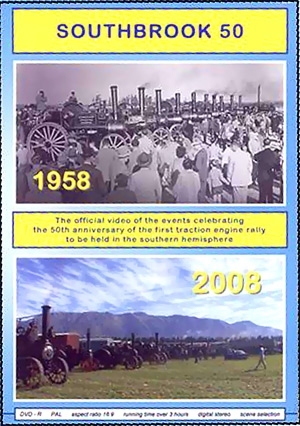 The Southbrook Traction Engine Club celebrated the 50th anniversary of the first traction engine rally to be held in the southern hemisphere with a series of events held over several weeks. The DVDs begin with a retrospective look at that very first rally, through photos and interviews with two surviving participants and with people who knew the engaging character who 'dreamt the dream', and then got the gig going … Then there was a playful weekend of threshing and chaff-cutting, during which a visitor from the UK suddenly found himself having to ’sing’ for his supper … … there were several road runs through New Zealands’ famously beautiful landscapes, with their amazingly uncluttered open roads - great running ! … and the finale was a fond farewell to those incredibly popular visitors from the UK, Quo Vadis and the Gallopers.